THEY started five years ago and more as a community of like-minded individuals with a dream and some grand ambitions. They believed the arts were one – as they were once upon a time on the subcontinent – and that the demarcations between music, dance and poetry were often artificial and unnecessary. 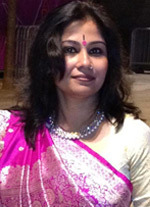 Since that time, Saudha, Society of Poetry and Indian Music, has grown substantially, and has hosted a number of concerts, some at prestigious venues such as the Southbank Centre in London and poet Keats’ old house in Hampstead. This Saturday (August 27), they host “Melody of Love & Shadows” in Wimbledon, fresh from performing at the Edinburgh Fringe. It will be another busy and exciting period for the group – as it builds on its Bangla Music Festival and plots to take its unique blend of music, dance and poetry to Europe and host new classical forms as part of its expanding repertoire, including Javanese Gamelan. www.asianculturevulture.com(ACV): You have just returned from performing ‘Melody of Love & Shadows” at the Edinburgh Fringe Festival (A, why did you go there? What was the thinking behind performing in Edinburgh? appeal to just one or two communities. The idea of finding a new audience without making any push (as pushing always cheapens the appeal of the art form and its artists) is therefore quite challenging. connect with those who don’t see themselves necessarily as fans or followers of Indian classical music. We don’t have a picture of the type of audience we want – we don’t just look at the usual sources or where most would think our appeal lies – we want to continue to expand and bring new people into the fold. The Edinburgh Fringe is simply an amazing festival to showcase your work to the audiences across the world. Quite fortunately our experimental production has been praised by a number of prestigious media and we have been invited to perform more by a number of prestigious art venues of the country and abroad – in Germany and Austria. It was our debut in Edinburgh. This event will also visit Nehru Centre in London on October 7 and London City University Hall on November 15. ACV: You are bringing ‘Melody of Love & Shadows’ to London this Saturday (August 27), will it be the same? AK: The idea of this touring concert is more or less similar in each performance. But we are having a Sitar here instead of the violin. Kathak dance and guitar are coming are additional to the Edinburgh Frine performance. But one thing I need to tell you, when it comes to Indian classical music, even same raga, if sang in different times, is not the same at all. You always have something new to explore – from this great improvised art of imagination and typical of the tradition of Indian classical music. ACV: You have some prominent new additions to your line-up, can you tell us about these please? singing in Wimbledon and the selection of poetry along with it, are idyllic with sitar accompaniment. Erik Schelander is a troubadour (in olden times a travelling poet-musician, and once very common all over Europe). He is a wonderful Schubert vocalist, actor and poet. In this show, he will sing French medieval music as part of the fusion. Anthony Hopkins is a very good guitarist and he is playing the accompanying guitar. 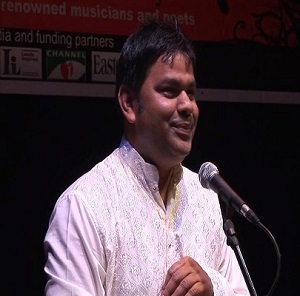 ACV: Your annual Bangla Music Festival is coming up (September 3-November 20 – on selected dates see link below), what is coming up there, what are the highlights? AK: This is the only other activity we do apart from classical music. This festival started with an objective to bring the magnificence of Bangla Music to a world platform. Because Bangla Music is more or less lyric based, it was hard to connect the audiences from the other languages. But over the last four years, we have managed to attract at least 30 per cent non-Asian audiences so far. The festival is spreading to different venues across the city and gradually this is becoming one of the major art activities in Tower Hamlets and turning into a sort of Tower Hamlets Fringe gradually. The festival is being held across different venues such Rich Mix, Keats House, Brady Centre, as well as pubs like The Water Poet to entice new audiences. ACV: You have built very solid foundations, what is the next level for Saudha? we are not working with other forms of classical music such as Javaneese Gamelan and will tour Europe next year. Saudha’s ultimate goal is be a global brand of pure and profound music by connecting audiences spread across the world. ‘Melody of Love & Shadows‘ 7pm – Wimbledon Library performing space, Wimbledon Hill Road, London SW19 7NB. BBC Asian Network Live – Up the hype…Wah! Wah! ← Shobana Jeyasingh – dancing like an Indian?